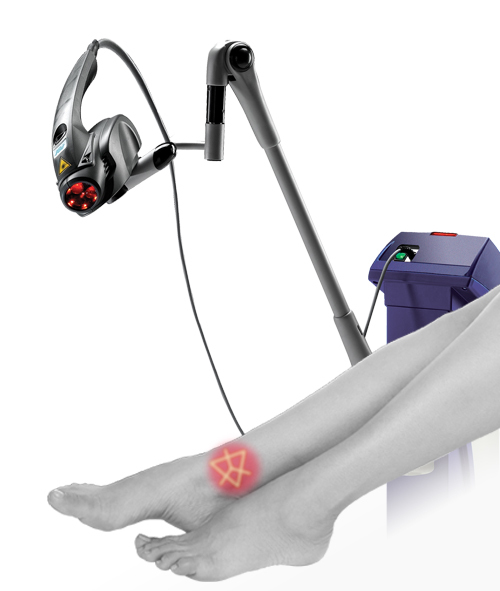 Laser Treatments | Foot & Ankle Doctors, Inc.
Our office is proud to offer groundbreaking laser treatments to treat foot and ankle pain, inflammation, and scarring. We have invested in the most advanced technology and are proud to provide our patients with the best and most advanced care. Laser therapy has FDA clearance and is proven to be successful by extensive and credible studies conducted in our country’s finest institutions, including Harvard University. Since beginning laser therapy in our office, we have had incredible results treating patients and reducing pain. MLS Therapy has been developed and tested following a strict course of biomedical and clinical research. The effectiveness of the MLS pulse was initially tested in vitro on cellular cultures, and finally by means of controlled clinical trials run by major state-of-the-art health organizations for treating traumatic or degenerative painful diseases. The results have been remarkable, many patients getting instant relief as quickly as after the first session. For more information about our laser therapy and to make an appointment, please call 310.652.3668. 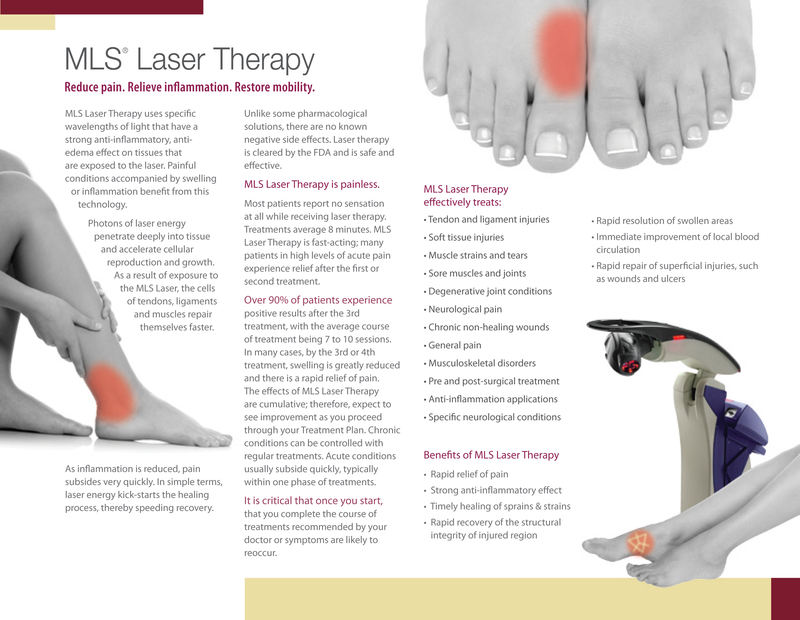 We are very excited to now offer a groundbreaking, effective, and pain-free laser treatment to treat nail fungus! This brand new, high-tech treatment is painless, side-effect free, and is the ideal way to treat nail fungus. In recent clinical trials, 81% of people undergoing laser treatment had moderate to complete clearance of the nail, and 51% were completely clear and tested negative for any fungal infection. This laser technology is the quickest, easiest, and most effective way to get rid of toenail fungus. The procedure time (between 20-45 minutes) depends on the severity and number of nails needing the treatment. It can take as little as one session of treatments to clear the nail, and most people will get clarity of the nail after two to three sessions. After treatment, the nail will grow out normally within 9-12 months. Below are some images of toenails infected with fungus, and the impressive results after the laser treatment as the nail is growing out. Call 310.652.3668 to schedule an appointment today. The laser beam travels through the nail, under the nail, and to the nail bed to kill the fungus instantly. The laser does not damage the nail or the surrounding skin. Though the laser does not clear the infection instantly, the new nail growth will look healthy as the fungus will be gone. The best part- this is done painlessly! No side effects, no oral medication, and no creams. Physical examination and a nail culture will confirm if you have Onychomycosis (a toenail fungal infection). Taking a sample of the nail and sending it to a laboratory will identify the type of fungal infection so that the doctor can manage the correct treatment. WHY DO I HAVE ONYCHOMYCOSIS? Nail fungus is quite common in the adult population. There are some statistics stating that as many as 50% of adults over the age of 40 have some kind of nail fungal infection. The most common type of fungus associated with onychomycosis and Athlete’s foot is called Dermatophyte. Dermatophytes grow in damp, warm, and dark places. They may be present on the skin but will not invade the skin or nail if there is no portal for them to infect. A nail infection usually occurs if there has been a history of injury to the nail, inflammation from an ingrown nail, or cutting the nails incorrectly or too short. Individuals who are medically compromised like patients with peripheral vascular disease, diabetes and HIV are more susceptible. Yes! Fungus thrives in wet conditions, so clean your shower stall, be careful when you get pedicures, throw out old shoes, and clean all of the socks and shoes that might be contaminated with the fungus. Then control the moisture in your shoes by using a foot powder. Believe it or not, even an under arm antiperspirant will work. Cotton socks or runners socks will help pick up the moisture in your shoes. And finally, trim your nails so that future infections can be prevented.